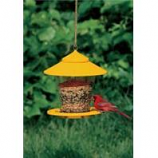 Heritage Farms manufactures bird feeders, squirrel proof, bird feeders, purple martin houses, squirrel feeders, hummingbird feeders, and birdbaths, along with a full line of accessories. Granary style basics bird feeder.. Provide an inexpensive functional and high catching decorator colors.. Fills via turn top.. Mounts: steel to eyelet provided for hanging or pole mount on 3/4 pole not included.. Capacity: 4 lbs of seed. Size: 10 diameter x 11 high mounts.. Hanging or pole mount on 3/4 pole included.. Prairie style basics bird feeder.. Contemporary square style featuring large roof overhang and extra seed capacity.. Fills via lift top.. Hanging cord included or pole mount on 3/4 pole.. Fills via lift top. 9 square x 11.5 high weight6.5 lbs. capacity: 5 lbs of seed. • Double Sided Feeding Draws More Birds To Yard. • Adjustable Weight Settings To Select The Birds You Want To Feed. 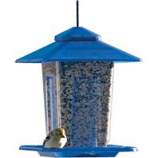 • Spring Operated Perch Drops and Automatically Shuts Off Access To Seed. • Holds Over 9 Pounds (1 1/2 Gallons) Of Seed. Front Seed Level Indicator Window. • Seed Saver Baffle Reduces Wasted Seed. Exclusive Top-Loc Feature Holds Top Open When Filling.